The invasion chorus is singing again—and making unfounded claims that forces in the conflict have used chemical weapons. Hawks, neoconservatives, liberal interventionists and others—truth be told, in Washington, nearly everyone except President Obama himself—seems to want to get involved militarily in Syria. The latest bugaboo: WMD. Haven’t we heard that someplace before? Say, ten years ago? Syrians may indeed be suffering, but a great deal of the suffering is due to the predatory and repressive actions by the Syrian rebels themselves, increasingly dominated by the radical-extremist Al Nusra Front. The beating administered last month offered a vivid illustration of the extent to which the Syrian revolution has strayed from its roots as a largely spontaneous uprising against four decades of Assad family rule. After mutating last year into a full-scale war, it is moving toward what appears to be an organized effort to institute Islamic law in areas that have fallen under rebel control. Building on the reputation they have earned in recent months as the rebellion’s most accomplished fighters, Islamist units are seeking to assert their authority over civilian life, imposing Islamic codes and punishments and administering day-to-day matters such as divorce, marriage and vehicle licensing. Numerous Islamist groups are involved, representing a wide spectrum of views. 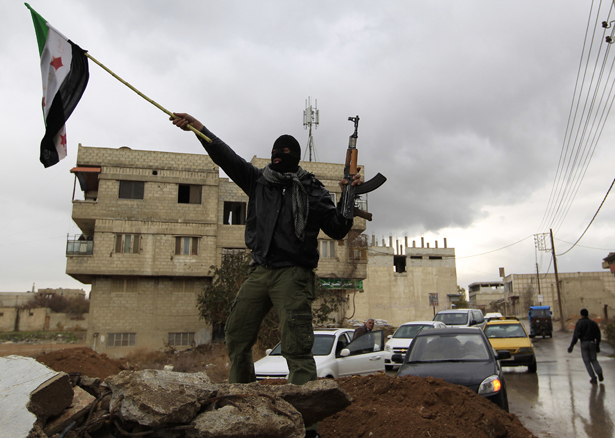 But, increasingly, the dominant role is falling to Jabhat al-Nusra, also known as the al-Nusra Front. The group has been designated a terrorist organization by the United States for suspected ties to al-Qaeda but is widely respected by many ordinary Syrians for its battlefield prowess and the assistance it has provided to needy civilians. Across the northeastern provinces of Deir al-Zour and Raqqah, where the rebels have been making rapid advances in recent weeks, Jabhat al-Nusra has taken the lead both in the fighting and in setting out to replace toppled administrations. It has assumed control of bakeries and the distribution of flour and fuel, and in some instances it has sparked tensions with local fighters by trying to stop people from smoking in the streets. But neither side presented clear documentation, and two American officials said there was no evidence to suggest that any chemical weapons had been used. A Defense Department official said the claim should be treated with caution, if not outright skepticism. Can this really be happening again? A phony WMD war in the Middle East? Answer: yes. Read Robert Dreyfuss on negotiations with Iran and how Barack Obama’s Israel trip could affect them.